This well attended seminar sponsored by APSE (Association for Public Sector Excellence) of was excellent. Held in the UNISON centre (HQ) in Euston Road, London. Speakers Paul O’Brien and Mo Baines, APSE; Neil McInroy CLES, Cllr Matthew Brown, Leader of Preston City Council and Cllr Asima Shaikh, Executive Member for Economic and Community Development, Islington Council. Chair was Mo Baines who works for APSE but is also a UNISON branch President and member nominated representative on the Greater Manchester Local Government Pension Fund. While Neil McInroy reminded that we live a world were 5 super rich men control 50% of its wealth while workers suffer wage contraction, how we must build wealth locally and stop global capitalism from extracting wealth for the super rich. 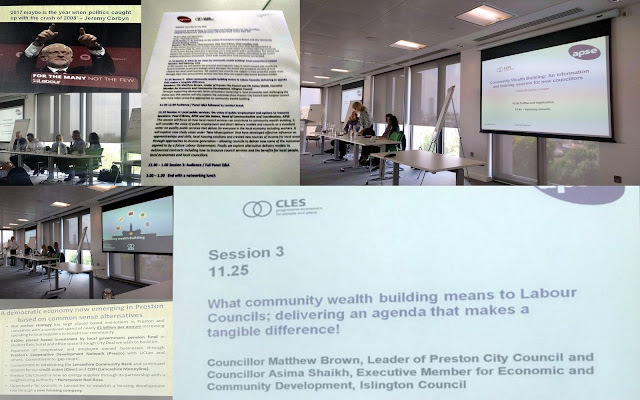 Cllr Matthew Brown described the "Preston Model" and long, hard, slog to bring about changes following the destruction of traditional local industries and the failure of private led regeneration schemes to develop the city centre. Cllr Asima Shaikh explained how Islington Council had won court battles over private developers who had overpaid for land and therefore claimed that they could not provide 50% social housing. A really positive event. At the end I had a number of very constructive conversations with London Councillors about the possible role of local government pensions funds investing in social housing. Watch this space.